In bowl of a large heavy duty mixer fitted with dough hook, mix together yeast, milk, honey and 1-1/4 cups [300 mL] bread flour. Beat at medium speed for two minutes until mixture is smooth. Add eggs gradually with sugar and salt. Reduce speed to low and gradually add most of the remaining flour kneading for 10 minutes until dough is smooth and elastic. Gradually beat in butter adding reserved flour if dough gets sticky. Dough should have a shiny appearance and not stick to sides of bowl. Place in large plastic bag and let dough double in size at room temperature; about 2 hours. Punch down dough, kneading lightly; return to plastic bag and refrigerate for 3 hours. Punch down dough again and knead in Balderson Royal Canadian Cheddar cheese and apples. Divide the dough into 18 pieces. Pinch off a quarter of each piece of dough and shape both the large and small pieces into balls. Set the large ball into a lined muffin pan; press the centre down to form a deep hollow; and set the smaller ball inside it. Allow brioche to prove until almost doubled in size, about 20 to 30 minutes. Pre-heat oven to 400°F [200°C]; Whisk egg yolk with 1 tbsp [15mL] water; brush brioches with the egg wash.
Place muffin pans on cooling rack; allow brioches to cool for 10 minutes before removing from muffin pans. 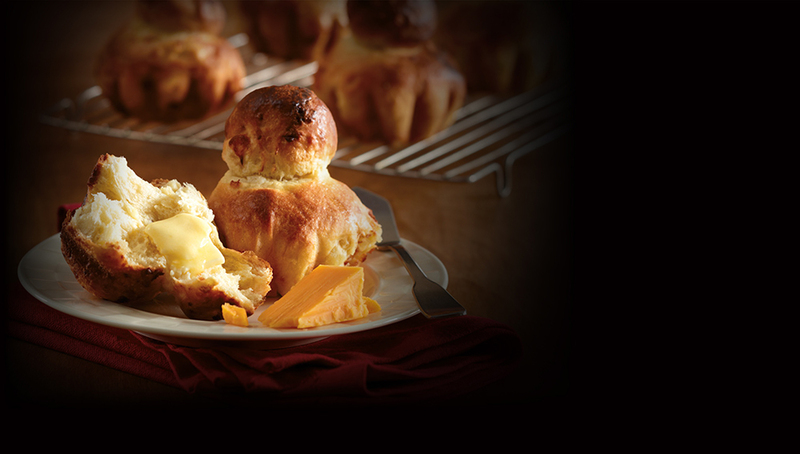 For authentic look use the small 3-1/2 inch [9 cm] brioche pans.